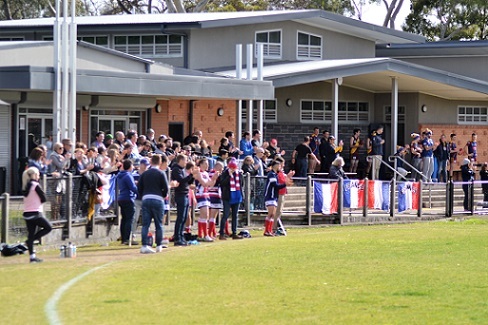 Victoria Park, Kew, played host to the French Les Coqs and the Nauru Chiefs in a Division 1 match up that – once again – would provide many in attendance with their first glimpse of International Australian Football. The French connection is relatively new here – however it was enough for the French to be the ‘home side’; and were hosted twice during the week for training and a Thursday night BBQ. 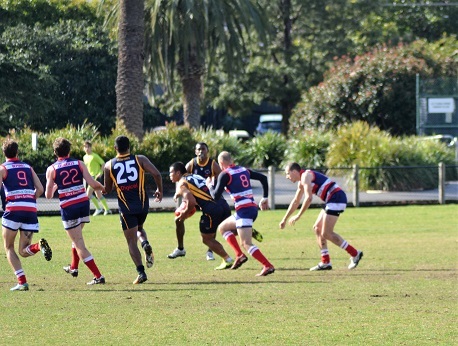 For local footy, 10AM is an early start – but often this time of the day provides the most stable weather. 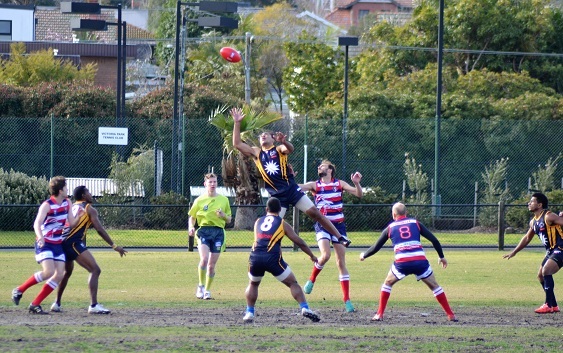 In fine conditions with patchy cloud – the odd cloud producing the threat of a shower but nothing of substance – Nauru won the toss and those to kick to the southern end of the ground. 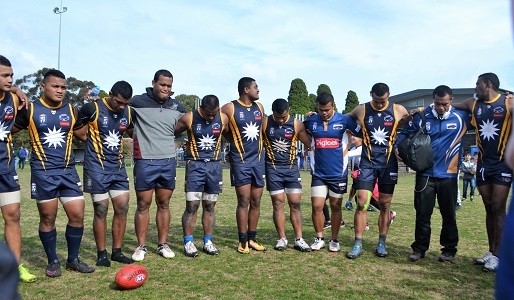 Pretty well from the outset it was clear that the Nauru Chiefs held the ascendency in generally ball handling and their transitions from defence were quicker and more free flowing. 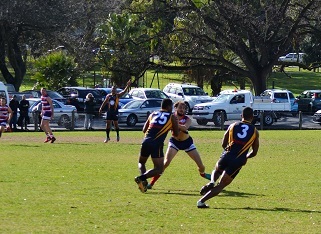 However the French defenders were readying the play pretty well and effecting a number of intercept marks. The tough park was to string together a succession of possessions. Tackling for the French was never in question – applying pressure to the Chiefs around the ground. The cracks though started to appear as the Chiefs got on the board via the silky smooth skills of Kenneth Oppenheimer (#11) with a fine right foot goal across the body. Without being an absolute procession – as the French fought hard – the Chiefs managed to hit the scoreboard regularly enough. Oppenheimer found the skipper Depaune (#15) who marked strongly from behind for the 2nd. Kanimea (#25) got on the end of a long shot from Tatum (#24) that dropped for a mark in the Goal square for the third. 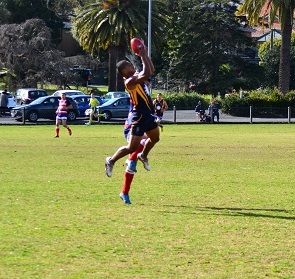 Then a passage of play via Oppenheimer and Donatello Moses (#12) and another shot by Kanimea went across the face to be marked by Maaki (#21) in the left forward pocket; running around on his right and slotted the 4th. The French though were not without their chances – managing to penetrate deep forward – and when Bernad (#13) snapped on goal for a behind they might have been on the board – however, infringed as he kicked it, he opted to take the free kick. 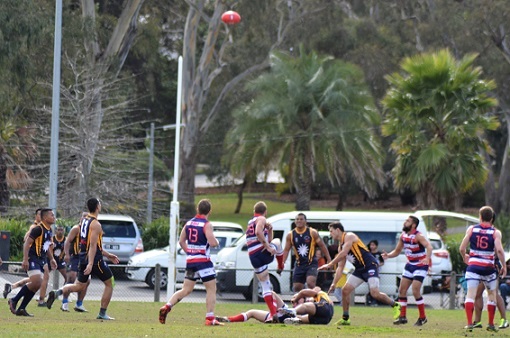 Falling short – the ball went out of bounds - alas no behind - whereupon the next few minutes was tightly contested mostly in the French forward 50. Nauru weathered the storm and as the siren went, Agir (#14) had just found the skipper who had a fruitless long shot after the siren. The second stanza was largely a continuation from the first. 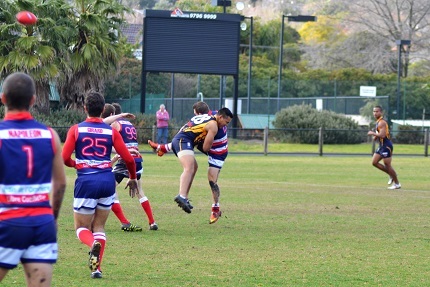 The Chiefs winning out of the midfield – with Tatum generally rucking against French skipper Depondt (#9). At ground level the Chiefs Batsiua (#8) would battle all day with his opposite number in Treuillet (#8). Mondin (#11) for France found himself often pitched against Waidabu (#9). The Chiefs soon kicked out to an 8 goals to nothing lead – via 2nd term goals to Yoshi Harris (#28), Waidabu (from a tight angle), Jose Uepa (#29) bursting through traffic and the ‘home crowd’ were wondering where the French might find a goal. 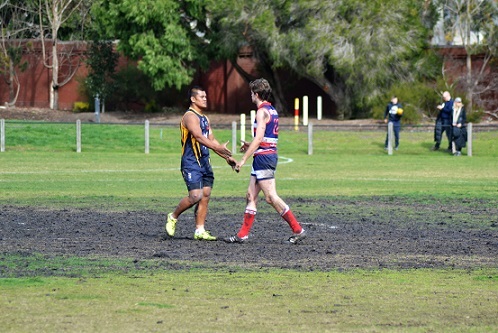 Well – it came via the big fella – Pierre Boscart (#19) – with a push in the back and a free from near the boundary in the left forward pocket. 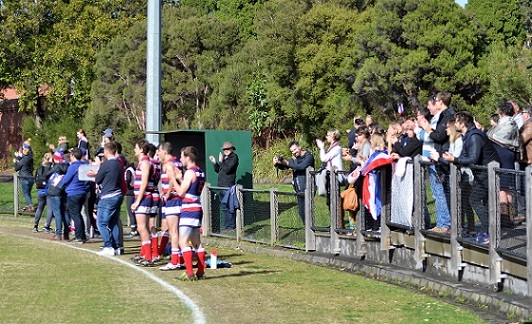 The kick sailed through – the umpire didn’t have to move – and the French supporters (including members of the European Crusaders) were cheering heartily. Perhaps stung by the goal – Nauru comprehensively won the next centre clearance, and after finding Diema (#3) at left half forward, he played on to track back in board and found the captain Depaune who marked and goaled. 55 points to the good at half time. 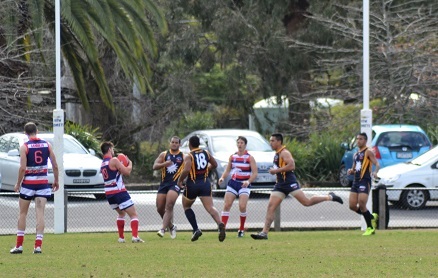 The Chiefs started the 3rd term in dominant style everywhere but on the scoreboard (as far as reward for the quarter). 5 successive behinds were poor reward. The French kick ins were under pressure and Deidenang (#19) was dominating in the air from full forward but missed 3 relatively simple opportunities. 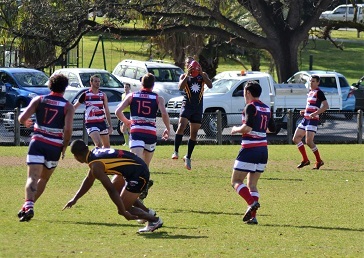 Finally his own drought was broken – when Kanimea spotted him up directly in front and from about 25m out steered through the 10th of the morning for the Chiefs. 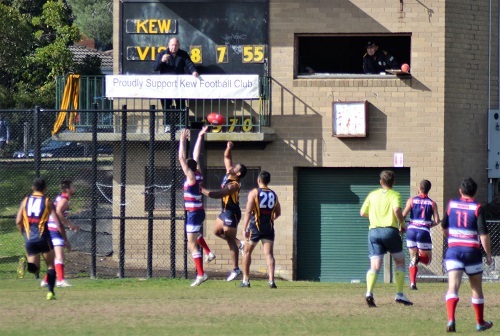 The flood gates looks to open as again attacking from the club rooms flank it ws Kam (#10) who again found Deidenang who showed better judgement in the air to mark in the goal square and convert the simple kick. 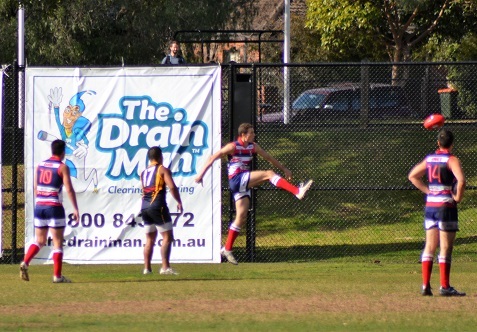 Spanner (#20 got in on the act with a long goal from out near the arc and the French were faltering. Perhaps the Chiefs relaxed a little – however the French fought hard and managed to push the ball forward and when Sardin (#10) was awarded a free in the left forward pocket – the resulting behind to the left of the stick was still rewarded with applause. However the French weren’t quite done with yet – holding the ball in the forward half again – they kept up the pressure and when Dagois (#29) snapped his errant kick fell into the arms of Sardin again. This time from a better angle he kicked truly and Les Coqs had their 2nd on the board. That saw out the 3rd term. Interesting to observe players negotiating what was become a muddy centre cricket wicket area. Few of the players would have encountered one before. 3.5 to 1.1 for the term did at least pay respect to the fight from the French – their coach urged them to dig deeper in the final term. The last term stuck largely with the script – Oppenheimer, who had been dangerous and creative all day – marked and kicked true for well out. The French did manage one last scoreboard impact – again via Sardin – a minor score; before the Chiefs ran out with goals from the neat Diema and the skipper Depaune who put the icing on the cake by caressing the 15th through the big sticks. The Chiefs satisfied with the job done – and after two disappointing outings against New Zealand and PNG – finally had their first win. The French coach was not entirely pleased with the performance – feeling that they hadn’t backed up well enough after a strong showing midweek. 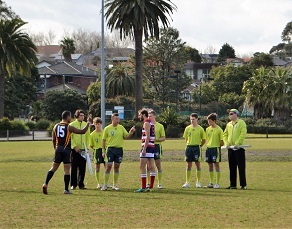 The uncertain ball handling could be attribute to the pressure of the Chiefs – however – coaches need their players to hold their focus even under pressure. Both sides look ahead to North American opposition at Royal Park on Tuesday. The Chiefs will take on Canada in what should be a very interesting encounter. The French will take on another red, white and blue nation in the USA in a contest that will test their ability to re-group.